One of the new things that I'm doing this year will be my Thanksgiving Common "Core"ses ELA centers. There are five centers for activities including point of view, Latin and Greek roots, author's purpose, verb tense, and figurative language. Click on the picture to check them out! I'm also thinking of trying this cute little class craft with my students. It goes with the book The Night Before Thanksgiving. 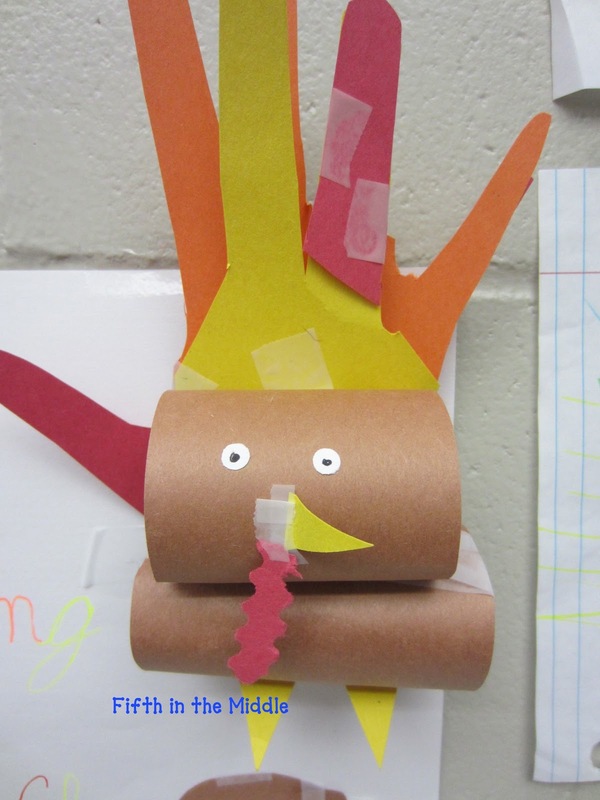 Each student creates a feather to help disguise the turkey. The pin doesn't go to the source of this picture, so I'm not sure why the original pinner didn't link it to her blog. If you know the original source of this picture, please let me know so I can update the pin. I love the disguise a turkey activity. I actually laughed out loud at the Taylor Lautner one. heehee. I can't wait to do this with my fourth graders this week! I love all of the turkeys. Two of the classes in my pod are doing this and I can't wait to see how they turn out. I'm sure they will be funny. I love reading 'Twas the Night Before Thanksgiving. It's falling apart from reading it every year. This is great! Those turkeys from last year look amazing - some very artistic 5th graders right there! I think I'm going to do something like wht you did with the book The Night Before Thanksgiving. I never heard of the book so about to go to amazon and check it out! Thanks for sharing such a fun idea!